Each of the core communications applications has been tweaked at least a little bit in iOS 8. Here are the new features. These two apps saw little in the way of updates within iOS 8. Individually, there are no obvious changes to their core functionality. It's incredibly easy to make calls, search through contacts, set favorites, and manage your communications. I do wish it worked better with social networks. For example, you can't see the latest Facebook or Twitter updates in individual contact cards, which you can see in Windows Phone and in the contact apps of some Android phone makers. Though there is a stand-alone Contacts application, it's integrated directly into the phone dialer application, too. 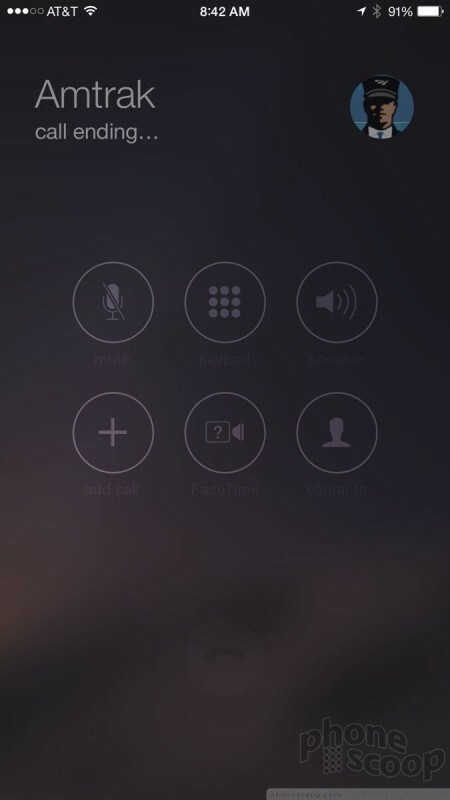 iOS 8 does introduce a couple of new features that are related to calling, the biggest of which is called Continuity. This allows iOS devices and Macs to interact with one another when it comes to calls, messages, and emails. Continuity won't be available between iPhones and Macs until Yosemite is released later this year, but some of the features are up and running between two iOS devices. For example, when an iPad with iOS 8 is operating on the same WiFi network as an iPhone with iOS 8, the owner can use the iPad - rather than their iPhone - to answer or reject incoming calls. This works well, though the quality of calls on the iPad didn't match the quality of calls through the iPhone. The tool also works in reverse. Using the FaceTime app on my iPad, I was able to initiate and make a voice call through my iPhone to another number. The UI is a little clunky, but it works. There are two other calling functions headed to iOS 8 devices eventually: Wi-Fi Calling and VoLTE. The iPhone 6 and 6 Plus will definitely gain these features, but it's not clear if others will. Unfortunately, neither is available at the moment to test. Sprint and T-Mobile already offer Wi-Fi Calling, but AT&T and Verizon won't until 2015. 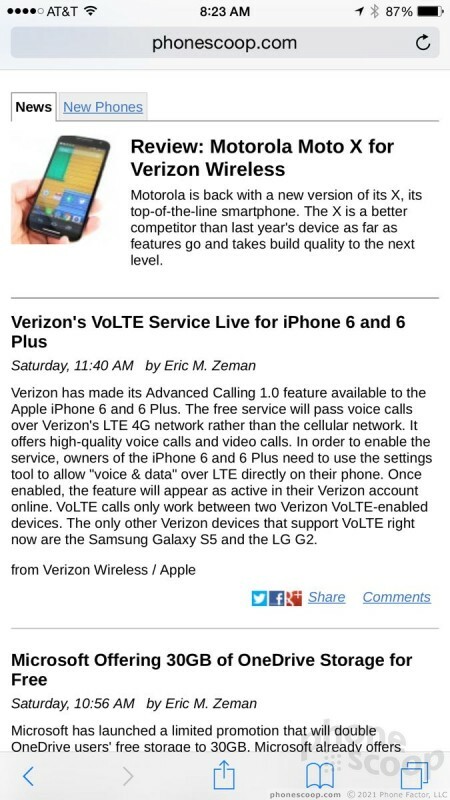 Verizon has already launch VoLTE on the iPhone 6 and 6 Plus with its Advanced Calling 1.0 function. It needs to be activated under the general settings menu, and requires to VoLTE-capable handsets in order to work. Wi-Fi calling, as the name implies, passes voice calls through Wi-Fi networks rather than cellular networks. VoLTE passes voice calls over the 4G cellular data connection, rather than the legacy 2G/3G cellular voice network. The calendar app is mostly unchanged. If users want, they can elect to view weeks by number, as well as view Chinese, Hebrew, and Islamic calendars. Other than that, it is carried over from iOS 7.1. The Reminders app is unchanged except for the addition of compatibility with Continuity. Reminders can pop up all over the place. The email application has been given some new tools for managing your inbox. The most significant functions are based on additions made last year in iOS 7. 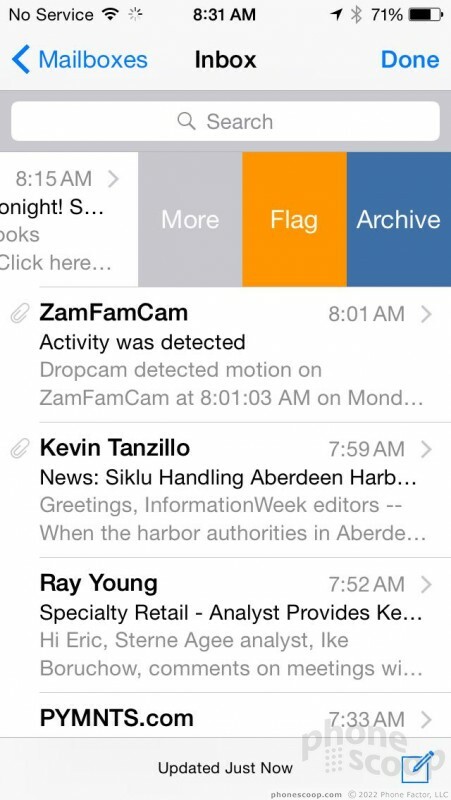 When viewing your inbox, new swiping gestures bring up a range of secondary actions for dealing with messages. For example, swipe an individual message from the left to the right, and a "mark unread" button appears. Alternately, swipe (gently!) from the right to the left, and a trio of buttons appear: More, Flag, Archive. Be really careful; if you just swipe aggressively it automatically archives the message. I wasn't able to find a way to un-archive them after accidentally archiving a few. If you tap the More button, you'll see an expanded list of actions, including reply, forward, mark as read, move to junk, move to folder, and others. Many of these actions are also available when viewing individual emails. They're accessible in the control strip placed along the bottom of the screen. Email is one of the apps that's compatible with the Continuity concept. It requires that the devices - an iPhone and an iPad or Mac - be in proximity with one another. 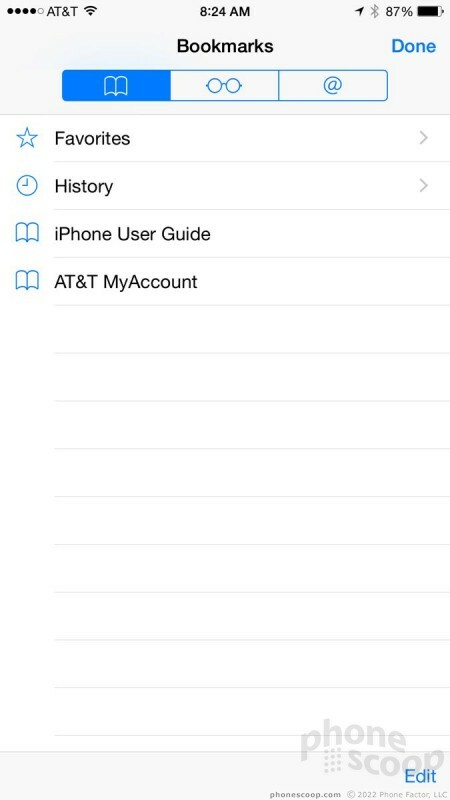 With Continuity enabled, iPhone users can start a task on one device and complete it on another. The devices actually pair with one another via Bluetooth to pass the information back and forth, such as draft email messages, browser sessions, reminders, and calendar appointments. The email app is better than ever, but still trails the stand-alone Gmail app made by Google in terms of usability. 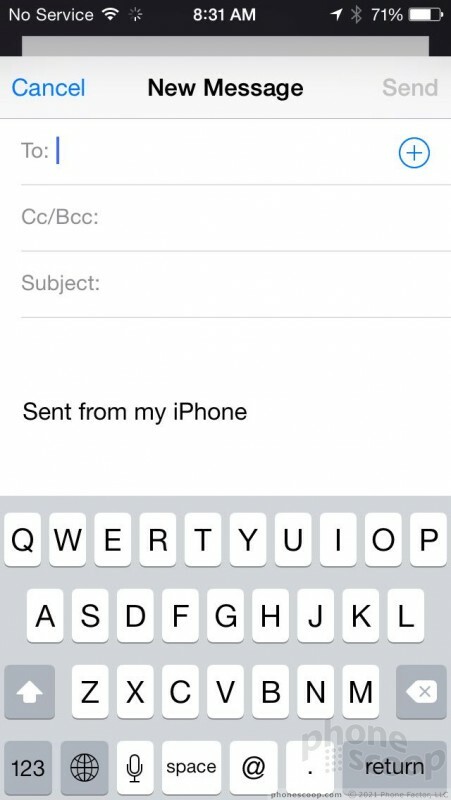 For example, Email on the iPhone still can't handle threaded conversations very well. Gmail on Android devices is still the class leader. Windows Phones' email app is solid, but has shortcomings of its own. 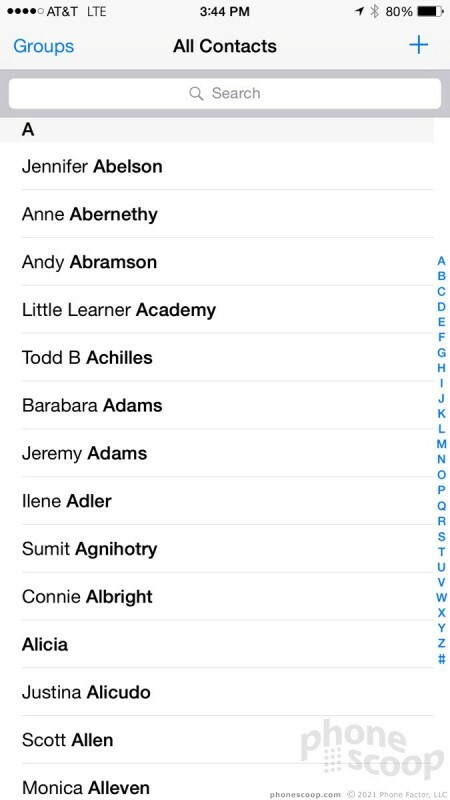 The only changes to FaceTime involve the launch page, which no longer shows a list of recent calls and instead lets you jump into your contact database. The FaceTime app is intended for live, person-to-person video chats, but it can can be used to make audio calls from one iOS device to another over 3G, 4G, or Wi-Fi. 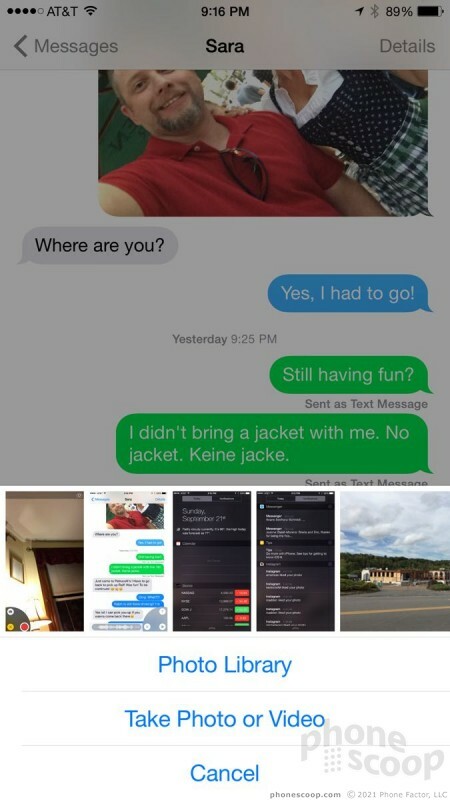 Apple made significant improvements to iMessage in iOS 8. For starters, it's compatible with the Continuity function. That means your Wi-Fi iPad can now send SMS messages to your friends without iMessage by automatically passing the messages through the SMS function on your iPhone. Most people will be happy with the *other* new messaging tools, which are much more obvious and useful on a day-to-day basis. For example, it is now really easy to attach audio clips to messages. The tool takes but a single press-and-swipe gesture that requires all of three seconds to master. The audio quality of the voice clips leaves a bit to be desired, but it's nice to have the feature on board. The tool for attaching images and video clips is identical. Press and hold the lower left corner to launch the camera/video camera. Interestingly, the default is to take a selfie or self video. If you want to attach an existing image from your photo library a short press (rather than a long press) will open the sharing dialog box. Last, you can also attach your location to a message and send it off to others. After the recipient has watched a video clip or listened to an audio clip, they have two minutes to decide to keep it or delete it. These features only work between iMessage devices, however. When texting someone using an Android device or Windows Phone, the messaging app behaves as it did in iOS 7 - that means no audio, video, or location attachments. That's a bit of a bummer, since nearly any phone can technically receive video and audio messages via MMS. The all-new keyboard for iOS 8 is a huge step up from iOS 7. To start, the keyboard has a new word-prediction engine. As you type, several words will appear in a line above the keyboard itself. They morph as you type, rather than just change instantly. Some may find the morphing words a distraction. I was often able to compose entire responses using these suggestions, which were much faster to tap than pecking out each and every word. The word prediction engine is really good. They keyboard itself remains rather cramped on the iPhone 4, 4s, 5, and 5c, but is much easier to use on the 6 and 6 Plus due to their larger screens. The keyboard also adds a massive number of emoji for enhancing messages and conversations. 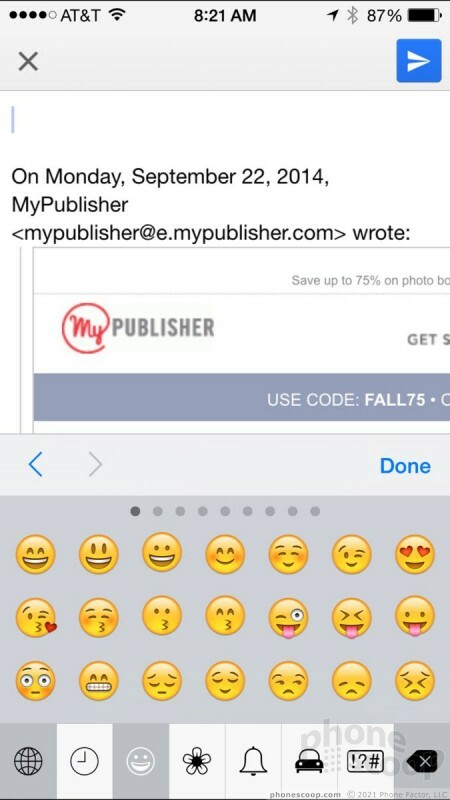 More importantly, iOS 8 adds support for third-party keyboards. For example, I downloaded and tested both Swype and SwiftKey on the iPhone. Both apps allow users to trace words across the keyboard in one touch rather than tap them out. I've grown used to this type of input on other smartphones and can no longer live without it. This is a catch-up feature for sure, as Android has supported tracing and third-party keyboards for years. Microsoft's keyboard app for Windows Phone is excellent, and includes built-in support for WordFlow (tracing rather than typing.) I'd love to see Apple develop its own trace-input method, but am happy enough to see third-party keyboards with this feature functioning on an iPhone. There are also unique third-party keyboards such as one that types exclusively in GIFs. If all you ever do is give the Safari web browser a quick glance, you might not ever notice the myriad changes buried in the app. Apple made plenty of changes to its mobile browser. To start, the address bar now offers web site suggestions as you type in URLs. 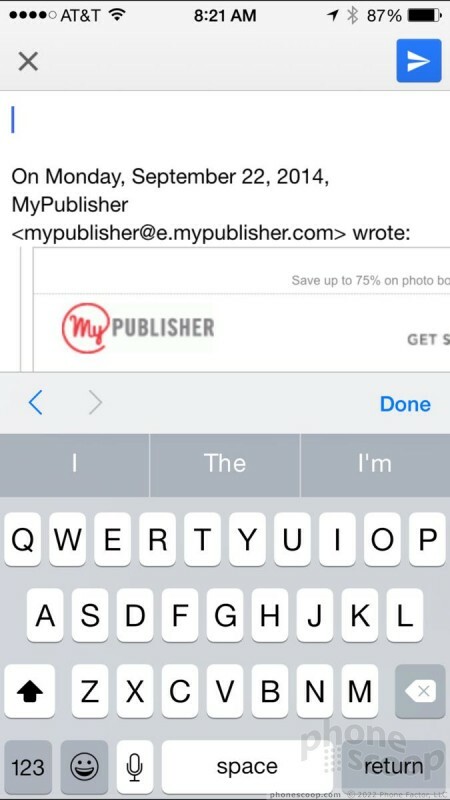 For example, I can type "p h o n …" and Safari will suggest PhoneScoop.com, complete with the thumbnail graphic. Safari has reimagined the way open tabs are displayed, and allows users to have private tabs running alongside non-private tabs. Further, opening a private tab is a cinch thanks to easier-to-find controls. There's a new tool for requesting desktop web sites when Safari sees it is being directed to a mobile-optimized web site. This can be helpful when you're familiar with the layout of a particular desktop site and would prefer to use that over the mobile site. Other under-the-hood updates include a way for app developers to share passwords amongst their sites, which reduces the number of times you may need to enter credentials. Apple also updated its rendering engine, which is much faster where it's embedded inside third-party apps. Last, Safari is better at crashing. When a web site causes trouble, it will now only crash the associated tab rather than the entire browser.